Bramalea CycleFest is completed for 2018. Stay tuned for 2019 plans! Here are details from 2018…. All People’s Church in partnership with BikeBrampton hosted the 4th Annual Bramalea CycleFest. 2 compost bins, 2 recycling bins, 1 landfill bin! Enjoy a day of fresh air and activity at 4th annual Bramalea CycleFest. Everyone is invited. You can bike, walk or rollerblade. All funds raised will go towards providing clean water for a village in Mali, Africa. Registration check in opens 8:30am All People’s Church, 41 Finchgate Boulevard, at Queen Street E.
Bramalea CycleFest is geared towards engaging our community in conversations about health and wellness, environmental responsibility and community engagement. The Region of Peel’s recent study highlighting childhood obesity is alarming. We want to make a difference. BikeBrampton is proud to support Bramalea CycleFest. Sponsors include: World Vision’s Global 6K for Water, Region of Peel, Peel Walk+Roll, Freddy Iype (Re-Max), Peel Regional Police, and City of Brampton. Build a team of 10+ riders from your organization to raise money. Register your organization as team. Make a donation! Sponsors and supporters of Bramalea CycleFest will be joining an annual movement that will reach thousands of households in the Bramalea area. Your business/brand will be associated with the event’s core principles. We are expecting 700 people! A friendly reminder, that helmet use with fastened chin strap is strongly encouraged, and is mandatory for those under 18. Parents have a duty to ensure helmet use for children under 16. 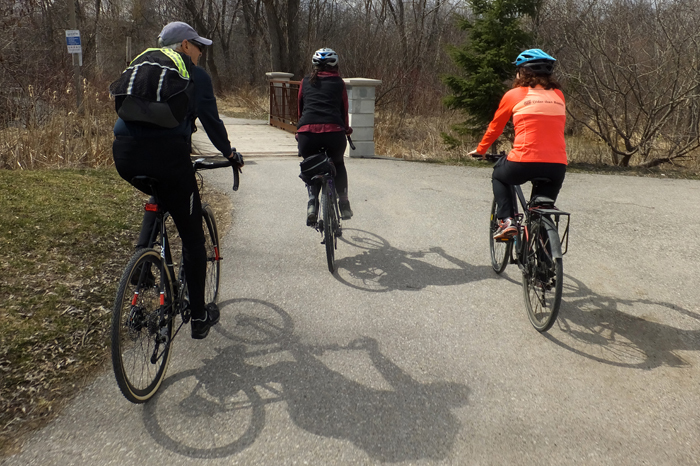 BikeBrampton volunteers plan Bramalea CycleFest routes.